London Crowd Counts Down Baby Blimp Liftoff [VIDEO] - Joe.My.God. 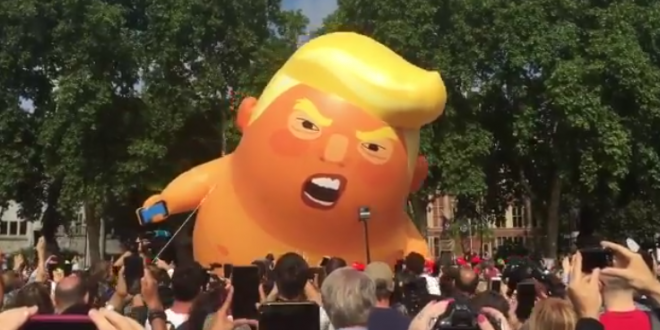 The most anticipated installment of Britain’s “Stop Trump” protests — a giant orange balloon of President Trump depicted as a pouting baby in a diaper and holding a smartphone — took flight on Friday from Parliament Square in London. As if they were waiting for a rocket launch, dozens of excited people — including activists, tourists, children and bystanders taking time out from their commutes — gathered around the 19-foot balloon and counted down from 10 before it was released into the air. “This is a victory,” said Leo Murray, an activist and the creator of the balloon. “People love it, he hates it, and it’s driven him out of London.” Thousands of demonstrators are preparing for a national rally in London at 2 p.m. to protest Mr. Trump’s policies.